Shop Ultimate Acoustics UAIS100 Ultimate Isolator Pad from AMS and enjoy Fast & Free Shipping. Ultimate Isolators have been designed to help you boost the accuracy of your monitors by providing a simple, affordable way to isolate your monitors from the surfaces you place them on. Using Ultimate Isolators, you will immediately notice enhanced clarity and bass response in your mixing environment. This will help you to prevent those unwanted surprises when you finally take that new mix out to the club or just to your car stereo, because you have a more accurate reference of your signal while mixing. 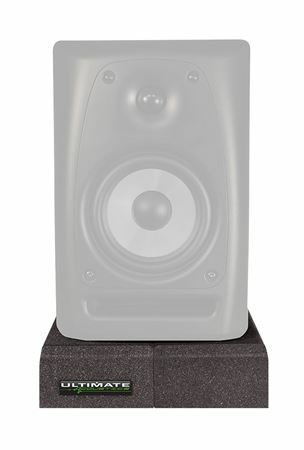 Ultimate Isolators can support a wide variety of studio monitors, from large to small format. Thanks to the angled design, you will be able to easily position your monitors at a number of angles, making them that much easier to drop into your listening environment and customize the placement to suit your “sweet spot,” all while making it that much sweeter. Ultimate Isolators are an affordable, versatile solution for an age old problem. Providing your monitors with the sonic isolation to prevent unwanted resonance in your room is every bit as important as choosing the right monitors because it gives you the best sense of what your recordings will sound like outside the safe haven of your studio environment. When you think of all the high price tags you’ve swallowed in the quest for the perfect sound, it seems almost crazy to pass up such an obvious advantage. Try Ultimate Isolators today- and hear what you’ve been missing!